As we prepare for the 2014 WNBA Finals, we’ll take a few looks here at Swish Appeal as both squads sharpen themselves for the final stanza of the current WNBA season. Here’s a player-by-player breakdown of the Western Conference Champion Phoenix Mercury with key facts, stats and analysis. The Phoenix Mercury were the best team in the league this season and will be the heavy favorites going into the WNBA Finals. 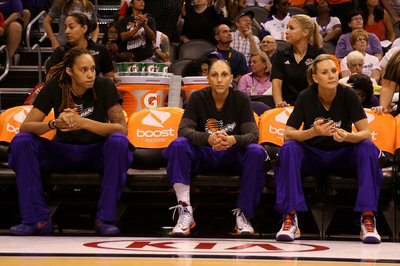 If Diana Taurasi and gang stick to the things that got them here, I like their chances. Team chemistry is an undervalued portion of team sports and it can make or break a team. Very seldom in the WNBA do you get a team that likes each other from start to finish but this team genuinely likes each other and wants to win for the player next to them as much as for themselves. Before we get into matchups with the Chicago Sky, let’s take stock of how each Mercury player has done individually during the first two rounds of the 2014 WNBA Playoffs. The 2014 MVP runner-up has raised her game in the playoffs. Taurasi has continued her league-leading pace in assists while getting her scoring closer to what we’re used to from DT. She did a fantastic job of leading by example and keeping her composure in Game 3 after losing her cool a bit in Minnesota, which caused a domino effect. Taurasi has returned to her mantle as the best player in the world and she’ll need to continue that pace to grab her 3rd WNBA trophy. Swish Appeal’s 2014 Comeback Player of the Year has done a fantastic job of what she’s called “filling in the gaps.” The Aussie’s transition into the starting lineup kick-started the Mercury’s 16 game winning streak and has filled up the stat sheet in the playoffs so far. In the deciding game of the Conference Finals series vs Minnesota, Penny’s line included 17 points, (10-11 free throws) 13 rebounds, 7 assists, and 2 steals. If Penny finds her three-point stroke in the WNBA Finals, Phoenix can start clearing space on the trophy rack. DB must’ve known that I removed her from my All-Defensive Team at the last second because she has made me regret it since the playoffs began. With the exception of her field goal percentage and nightly assist average (2.3 to 2.2) all of Bonner’s numbers have increased in the postseason while playing 7 additional minutes per night. Bonner will likely face her toughest matchup of the playoffs so far in the Finals, likely seeing Delle Donne for long stretches. Dupree continues to do an amazing job of picking her spots and making the defense pay. Her FG and FT shooting numbers are up but her rebounding and scoring numbers are down, illustrating that “CanDu” is being extremely efficient in limited touches. Phoenix has made a concerted effort to take advantage of Griner’s size advantage in the playoffs but the “Smooth Operator” has continued at nearly the same rate of the regular season. I mentioned above about Griner’s increased touches, and boy has she responded. Shooting just under 65% and having made all of her free throws, Griner has done a fantastic job of making teams pay on the offensive end. Her rebounding and block numbers are down as teams have tried to pull her out of the paint as much as possible, but this team has called upon Griner and she’s come to their rescue. Erin Phillips was brought in to be an additional ball-handler and three-point shooter while playing solid defense and she’s done just that. Earlier in the season, I spoke about Phillips’ efficiency as a ball-handler while she was struggling with her shot early in the season and it’s continued in the playoffs. With an assist-to-turnover ratio of 4:1, EP has quietly played fantastic basketball in the postseason. Bass has done a great job, as she always does, of coming into the game and playing physicaly, solid defense and rebounding the ball. It could be difficult for a player to have the pressures of coming off the bench behind Candice Dupree and Brittney Griner but Bass is a true professional and brings maximum effort on a nightly basis. AJZ is a deadly shooter from three-point range and has shown an improved handle this season. She hasn’t seen any meaningful minutes in the playoffs but she’s a veteran player that both Taurasi and Brondello are comfortable with and they know what they are going to get from her. AJZ scored 31 baskets during the regular season, 15 were three-pointers. 2014 has been a year of development and learning for the second round pick out of Oklahoma State. Bias hasn’t seen a minute of time in a competitive game but competing against Olympians like Taurasi, Taylor and Phillips in practice each day, along with having a former All-Star guard in Brondello as a coach, has been invaluable and the rookie seems to have enjoyed every bit of the ride. Bias’ speed and propensity for disrupting offenses will give her a shot to stick in the league but she’ll need to improve in all facets to dent a rotation in the future. SIZE; Diana Taurasi is the Mercury’s shortest starter at 6’0″ and this creates problems on both ends of the floor. The Mercury’s length and size creates mismatches on the offensive end while also helping with rotations/recovery on the defensive end. Sandy Brondello and her staff do a fantastic job of taking advantage of the mismatches this size difference creates. OFFENSIVE EFFICIENCY and TEAM SHOOTING: Phoenix has been known for their offense for years but they went about it differently this season. In years past, it was all about pace and taking more shots than your opponent but this season they led the WNBA in FG%, pace, PPG, total points scored, 2FG%, and offensive rating while finishing second in the league in 3FG%, FT%, total field goals made, total free throws made, and assists. DEFENSE: For most, it seems to still be weird to talk about defense but that’s the case this season. Phoenix was the WNBA’s stingiest team in terms of FG%, 3FG%, while leading the league in blocks and defensive rating. This team also allowed the second fewest total points, points per game, 2FG% while also allowing the least free throw attempts in the league by committing the least fouls in the WNBA. Phoenix also lead the WNBA in the regular season in shot clock violations forced, with 42. REBOUNDING: For all the talk about size for the Mercury, they’re an underwhelming rebounding team. The Mercury finished right at league average in terms of total rebounds and grabbed the second fewest offensive rebounds this season. Looking at the numbers initially, you would think the Mercury did a better job defensive rebounding as they grabbed the second-most defensive rebounds this season but they also allowed the third-most offensive rebounds and finished just ahead of the extremely undersized Seattle Storm for the worst rebounding percentage in the league. DEPTH: The Mercury bench is loaded with veterans who fill their roles admirably but the Mercury only got 16 points off the bench in the regular season and are now only getting 8.2 points as the rotations have shortened in the playoffs. A key in their Game 2 loss to the Lynx was Penny Taylor’s foul trouble along with Bonner’s lack of production, something the bench was not able to help them overcome. If the Mercury have a game in the Finals where a starter is struggling or in foul trouble, the bench will need to do a better job of impacting the stat sheet. PASSION VS EMOTION: A bigger key to Game 2 may have been the officiating and how the Merc responded. I always talk about players talking to officials and it’s very much a part of the game. What needs to happen, if the Mercury want to be successful, is that these conversations need to be of the careless type during free throws or pregame warmups. If Phoenix gets caught up in arguing with officiating, it takes away from the focus of the game. Now, any team led by Taurasi is going to be fiery and this team plays well with a chip on their shoulders, but they need to find a solid balance of being passionate, and not emotional. Sandy Brondello has pushed all the right buttons for this team. Phoenix still hasn’t suffered back-to-back losses since being eliminated in 2 games in last year’s WCF, but I doubt Brondello will have to get them excited for this 5-game series for the 2014 WNBA Championship. For more on the Mercury and the championship series, check out our 2014 WNBA Finals storystream.